I better post this recipe since the warm weather is fast approaching – 75 degrees in Buffalo this weekend! Yeah – finally! I cannot wait to finally open the windows and get some fresh air in the house! So it’s best that you bookmark this one for next fall, because I sense that some grilling recipes are coming soon and chili season is over! 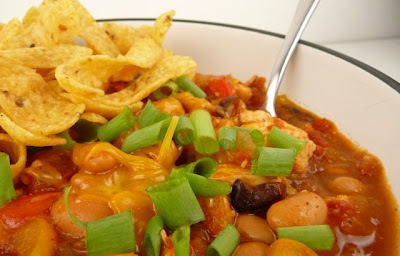 But this chili would be worth the wait – it was the perfect blend of spices and seasonings. Definitely going to be added to my chili repertoire! 1. Preheat the oven to 375 degrees F. Line a baking sheet with foil. Place the chicken breasts on the foil, and season with salt and pepper. Fold the foil over the chicken breasts to make a “packet”. Roast 30-40 minutes, or until the chicken is cooked through (about 165 degrees internal temp). Allow to cool enough to handle, then shred or chop into bite-sized pieces. 2. Heat the olive oil in a large stockpot or Dutch oven over medium-high heat. 3. Sauté the onions 10-15 minutes, or until tender and translucent. 4. Add the garlic to the pot and sauté just until fragrant, about 1 minute. 5. Mix in the chopped bell peppers, chili powder, cumin, red pepper flakes, cayenne, oregano, chipotle, and kosher salt. Cook 5 more minutes. 6. Using clean kitchen shears, cut the tomatoes in the open can roughly. Add the tomatoes with the puree to the pot and bring the mixture to a boil. Reduce to a simmer and cook for 30 minutes, uncovered, stirring occasionally. 7. Stir in the shredded chicken and the beans, and allow to simmer for another 20 minutes. This looks delicious and healthy...lovely for a weekend lunch. I like it.